Oval-pan heads with beveled sides prevent removal with conventional tools. Install in a recess for utmost security. Can only be removed by tools exclusively manufactured in the USA by Ultra Fasteners – not available in hardware stores. Does not invite tampering as it appears to be an ornament rather than a fastener head. No ﬂutes, recesses, holes or sharp edges. Ideal for medical and food-handling equipment – design prevents trapping of bacteria or food. Ideal for electronics – design prevents electron discharge. No sharp edges to snag clothing or cause injury. Male-headed screws can be held in place by the screwdriver before entering the workpiece, simplifying their use even when access is limited. Avsafescrews.com is the leader in Avsafe and Oval Pan Security Screws. Available in Standard and Metric sizes and a variety of material including Zinc Plated Steel, 18.8 SS and 316 SS.. Contact us today for pricing and delivery.. 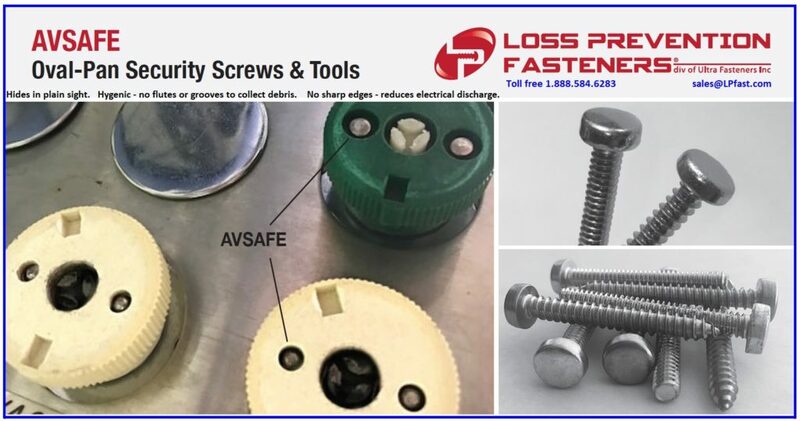 If your looking for a larger selection of Security and Tamper Proof Fasteners including Concrete Fasteners, Sheet Metal Screws, Machine Screws and more check out www.lpfast.com ..